Each year Britain discards over 40 million old car tyres which all need to be reprocessed or recycled. To handle all of these tyres efficiently and responsibly the Tyre Recovery Association have created a unique industry partnership: The Tyre Industry Federation Responsible Recycler Scheme – A uniquely successful industry initiative. The Tyre Recovery Association believes a circular economy is essential for environmental sustainability. By transforming used tyres into a useful commodity, carbon emissions are reduced and the environment benefits. There is an increasing number of opportunities to use tyre-derived materials, creating new businesses as well as jobs. 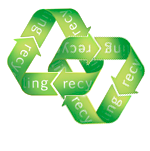 The TRA encourages consumers to make recycling a habit as well as tyre collectors and recyclers. Consumers can be confident that TRA’s Responsible Retailer partners will process used tyres in an environmentally friendly and acceptable manner.